Shirts With Random Triangles: Texas A&M Reportedly Seeking To Fire Head Coach Kevin Sumlin? "Two sources close to the situation said Texas A&M chancellor John Sharp is very concerned about the internal direction of the Aggie football program under Kevin Sumlin, 51, and is looking into the possibility of terminating Sumlin's contract, which has a $20 million buyout." 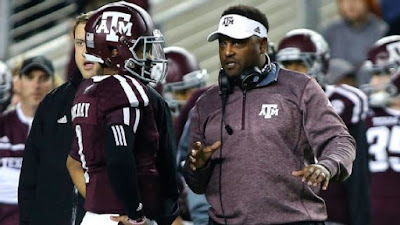 Brown went on The Arkansas-based Sports Talk with Bo Mattingly on Friday, claiming the school is looking for reasons to fire Sumlin for cause, thus avoiding the $20 million dollar buyout, or fails, looking to halve halve the buyout down to $10 million. Sources claim that an attorney representing Sumlin has the school would face a lawsuit should it try to fire him. Time for the silliness to kick in. Brown's sources claim Texas A&M would seek to replace Sumlin with either Houston head coach Tom Herman, or North Carolina head coach Larry Fedora. Herman and Fedora both recently signed contract extensions with their respective schools, so don't expect that to happen. So far, ESPN hasn't reported the story, so file this one in the "Voices in your head don't count as reliable sources" department. The story on Sumlin's future at Texas A&M follows the departures of highly-touted quarterbacks Kyle Allen and Kyler Murray.